Stewart unleashed his comedic wrath on Senate majority leader Harry Reid for claiming Mitt Romney’s dead father, George, would be ashamed of his son. 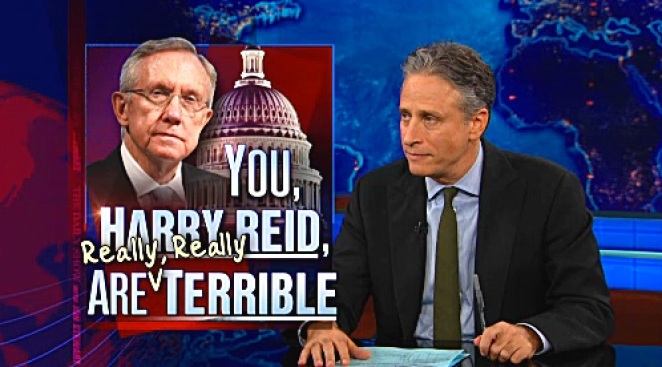 Jon Stewart unleashed his comedic wrath on Senate majority leader Harry Reid on Wednesday, spearing him for claiming Mitt Romney’s dead father, George, would be ashamed of his son. “I can’t believe you just went dead dad shame on Mitt Romney,” said an agast Stewart. In an interview with the Huffington Post, Senator Reid said he spoke with a Bain insider who told him the presidential candidate hasn’t paid his taxes for 10 years. The late night host remarked that wild speculation over the nature of Romney’s taxes is more in line with the job of a late night comic, rather than a senator. “You know what Harry Reid, if you’re not going to fact check anything that comes out of your mouth, I will,” Stewart declared. Pulling out an Ouija board, Stewart proceeded to channel the ghost of Romney’s father, to ask whether he was proud of his son. With his hands on the planchette, Stewart was guided to his answer: Yes. “Oh wait, there’s more!” Stewart began, before launching into a heated tirade, purportedly on behalf of George Romney, defending his son. “I had no idea how precise these things were,” Stewart quipped.